How do I cut the bottom off a glass wine bottle? Recently at a party, I saw empty wine bottles that had the base cut off so it could be placed over a candle. It made an elegant and interesting centerpiece, and I have some very pretty wine bottles that I'd love to convert to candle covers. How do I cleanly and safely cut the base off a glass bottle? I'd like a reliable method so I don't risk destroying the bottles (I don't have many of them). There are certainly several methods to be found online however most of them can have mixed results where you edges are concerned. This can be done rather well with a scoring jig, regular glass cutter and water. Depending on how often you are going to be doing this will influence the tools and jig. 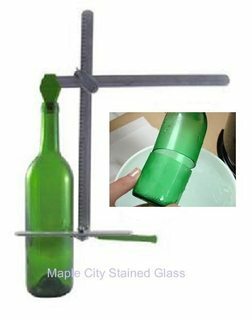 Cutting glass, so that it breaks predictably, can be done well with a glass cutter, or similar tool, and the right pressure. You need to be able to move the bottle around and apply consistent pressure with the cutting tool. 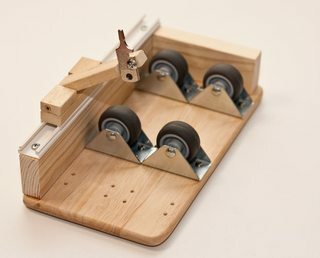 Again, you will find oodles of options for these jigs but a simple one involves some wood and casters. The frame needs a base with a tool rest and a back where the bottle bottom will rest. At least four casters will help the bottle rotate while you score the outside (I also saw two mounted rolling pins for this). The jig picture above has a dedicated adjustable cutter. This is helpful but not required. Using the side of the jig as a tool rest you can rotate the bottle with one hand while using the other to set the cutting pressure. There are several commercial products that can do this as well if you are more comfortable. In use it would look like this. 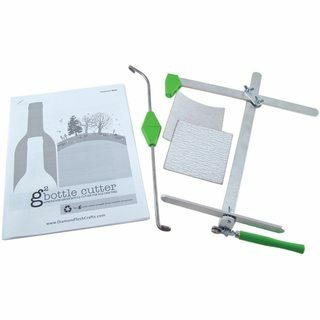 I have glass cutting experience but have never used a product like that. Videos of them used look very promising though if you are willing to spend the money. Assuming you have a good score line then it is just a matter of encouraging the glass to break. This is surprisingly easy with some boiling water and cold tap water. You basically need to rapidly change the temperature of the glass near the score. You don't need extreme temperature for this though. This likely has to be repeated a couple of times. Pour over boiling water slowly and rotate the bottle while pouring. After about 10 seconds of this you can take the bottle to the cold water from the tap. The change in temperature should put enough stress on the bottle and it should fall apart. If you score line was good there is minimal clean up required and some light sanding would give you a smooth surface. This also give you both ends of the bottle in a usable state. There are a few different ways to do this, but most of them involve extremes of temperature: first intense heat along the line where you want to cut the bottle, and then submerging in cold water, repeated several times if necessary. After heating the bottle up along the score line, dunk it in a pail of cold water (which you should have prepared beforehand). The shock of passing from heat to cold should weaken the bottle and make it likely to crack along the existing score line. It's likely that the bottle won't break the first time you do this, but keep repeating the process multiple times (heat, cold water, heat, cold water) and eventually the bottle should snap in the right place. Again the basic idea is to alternate extreme heat with extreme cold, but this time you don't need to have a scoring tool because you'll be using a piece of string. You also need something containing acetone, the most commonly used example being nail polish remover. Take a piece of string, soak it in nail polish remover (or anything else acetoney), and wrap it around the place where you want to cut the bottle. Then set the string on fire, which will apply intense heat to the narrow area on the bottle around where the string is tied. (Obviously, you need to take care that the string doesn't slip to a different position on the bottle. Even more obviosuly, make sure you don't have any of the acetone on your fingers and that the bottle of nail polish remover is placed well away from the flame.) When the flame burns out or you feel enough heat has been applied, dunk the bottle in a pail of cold water as before to provide the stress necessary to crack it. Again, this is unlikely to work the first time, but you can keep repeating the process, either re-soaking the string to light it again or replacing it by a new piece of string if necessary. Whichever method you use, the bottle may not snap completely cleanly, so you should use some sandpaper to smooth off the edge of the broken bottle before using it. You can see pictures and videos of the process here and here. I'll try to add some images and hopefully gifs to this answer later on. There's also an urban myth that you can cut glass underwater with just an ordinary pair of scissors. I'm not sure whether or not this is true, and I haven't gone to research it, simply because it wouldn't be relevant for your problem anyway. A rigid object in the shape of a hollow cylinder can't be cut with a pair of scissors whatever material it's made of; the underwater cutting, it true, would only work for flat panes of glass. I wonder what the incentive of cutting underwater is. You can only do it with flat glass. Edges would be very rough. Then you have water with a bunch of glass in it. It's been done for decades apparently. https://www.youtube.com/watch?v=usZ8MQzbglk. Doubt it at all applies to cutting a glass bottle in the way desired here. There is yet another, more elegant solution, requiring no cutting tools. Safety goggles or glasses. Protect your eyes. piece of iron, to be held by tongs or pliers. Fill the glass container up to the place that you want it cut. Set the glass container in the metal bowl, and fill the bowl up with water to match (or be just a smidge below) the level of water in the glass container. Pour oil into the water of the metal bowl. It will float on top, and there should be enough oil that the entire surface is covered. Holding the piece of iron (or similar metal) with the pliers or tongs, heat it until red hot with a torch, lighter, or gas stove. Holding the piece of iron (or similar metal) with the pliers or tongs, dip it (and keep holding it) into the oil floating in the metal bowl. Remember to wear the goggles, and to keep the heat away from skin and flammables. Here's a video: How to cut a glass bottle. The video in the post you linked to appears to be fake; here's another that shows roughly the same technique. What can cut curve curved glass? How do I remove labels from glass jars/bottles?